The Government always needs more money, and the Great War, or "War to End All Wars," was to be no exception. Liberty loans or bonds were sold by the federal government during World War I (1917-1919) to raise money for the war. These were labeled as 'loans,' because they promised interest to the bearer. when you subscribe to the Victory Liberty loan." 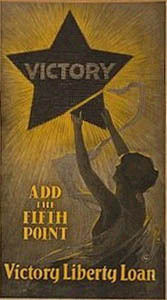 On March 3, 1919, the "Victory Liberty Loan Act" was signed into law. The medals were made from German cannons captured by American troops at Chateau Thierry. These cannons were melted, and the metal roiled into sheets, from which the medals are made, and conferred by the Treasury Department on volunteers in the Victory Liberty loan campaign volunteers. About a half dollar in size piece, the obverse of the medal, exhibits a eagle grasping three arrows in one claw, and an olive branch in the other, flying below the U.S. Treasury Building, and reads "Victory Liberty Loan". The reverse reads: "Awarded - By the U.S. Treasury Department For Patriotic Service In Behalf of the Liberty Loans - Made From Captured German Cannon". The 1933 'Century of Progress' World's Fair in Chicago celebrated the city's centennial, and the theme of the fair was technological innovation. The fair was opened on May 27, 1933, when the lights were turned on with energy from the rays of the star Arcturus, chosen as its light had started its journey at about the time of the previous Chicago world's fair - the "World Columbian Exposition" - in 1893. The rays were focused on photo-electric cells in a series of astronomical observatories and then transformed into electrical energy which was transmitted to Chicago. One of the highlights of the 1933 World's Fair was the arrival of the German airship "Graf Zeppelin" on October 26, 1933. Originally, the fair was scheduled only to run until November 12, 1933, but it was so successful that it was opened again to run from May 26, 1934, to October 31, 1934. This Union Pacific 1934 'Lucky Piece' contains a wonderful image of a classic Deco styled train engine portrayed on the front of the coin. The reverse reads "A sample of the aluminum in the new Union Pacific Train built by Pullman Car & Mfg. Corp. Aluminum Co. of America" and shows the logo of Alcoa, the world’s leading aluminum company. Cà d'Zan, John and Mable Ringling's Venetian Gothic mansion on Sarasota Bay, is one of America's important historic houses. The imposing structure was originally intended to combine certain architectural features drawn from two of Mrs. Ringling's favorite Venetian hotels: the Danieli and the Bauer-Grünwald. Dwight James Baum of New York supervised final plans and the actual construction. The Ringlings moved into the mansion just before Christmas in 1926. Cà d'Zan--which means "House of John" in Venetian dialect--took two years to build at a cost of approximately $1.5 million. The house is 200 feet long with 32 rooms and 15 baths. Its interior plan features the Court, a vast two-and-a-half story room which served as the main living room. Kitchens, pantries and servants' quarters are located in the south wing. Terra cotta balustrades enclose an 8,000-square-foot terrace of variegated marble overlooking Sarasota Bay. Bricks, terra cotta "T" blocks and poured concrete were the primary construction materials, and terra cotta was the principal decorative material used (exterior and interior) because the glazed finishes would best withstand Florida's brilliant sun. Mable Ringling personally visited the kilns to make sure the colors - soft red, yellow, blue, green and ivory - were precisely what she wanted. Shipped from Barcelona were thousands of old, red barrel tiles for the roof. The mansion is topped by a 60-foot tower, which the Ringlings kept illuminated when they were in residence. Mable died in June of 1929, at the age of 54, just two-and-a-half years after Cà d'Zan was completed. John died in 1936, at the age of 70, willing his collection of art, the Museum of Art, the mansion and grounds to the state of Florida; however, ten years passed before his estate was settled and the Museum was able to open its doors in 1946. In July 2000, Florida legislation appointed Florida State University as the guardian of the estate. The '''Golden Gate Bridge''' is a suspension bridge spanning the Golden Gate, the opening into the San Francisco Bay from the Pacific Ocean. It connects the city of San Francisco on the northern tip of the San Francisco Peninsula and a portion of the south-facing Marin County at the Marin Headlands near the small bayside town of Sausalito, California. The entire bridge (including the approach) spans 1.7 miles (2.7 km) long; the distance between the towers ("main span") is 4,200 feet (1,280 m), and the clearance below the bridge is 220 ft (67 m) at mean high water. The two towers rise 746 feet (230 m) above the water. The diameter of the main suspension cables is 36 inches (0.91 m). The Golden Gate Bridge was the largest suspension bridge in the world when it was built in 1937 and has become an internationally recognized symbol of San Francisco. The bridge is also widely considered one of the most beautiful examples of bridge engineering, both as a structural design challenge and for its aesthetic appeal. It was declared one of the modern Seven Wonders of the World by the American Society of Civil Engineers. According to Frommer's travel guide, the Golden Gate Bridge is "possibly the most beautiful, certainly the most photographed, bridge in the world." 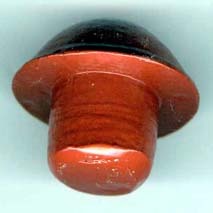 Overall, the rivet measures about an inch in height, and and half and and half in diameter. Along with the rivet is an orange card, reading, "An original rivet used in constructing the Golden Gate Bridge. It was removed as part of the Bridge maintenance program, sandblasted and handpainted with International Orange alkyd, as a memento of the World's Most Famous Span." Knife Made From Steel From The "Honeymoon Bridge" Near Niagara Falls. Designed by Leffert E. Buck, and built by the Pencoyd Bridge Company of Philadelphia in 1898, the "Upper Steel Arch Bridge", or the "Falls View" or "Honeymoon Bridge", as it was later known, was a two-hinged steel arch bridge connecting road traffic between Niagara Falls in New York state, and the city of Clifton, in Ontario, Canada. At that time it was the greatest steel arch bridge in the world. In 1899, one year after the completion of the Upper Steel Arch Bridge one of the most spectacular ice bridges ever to be seen formed below the Falls. The ice gathered around the abutments of the bridge to a height of 80 feet (24m) extending to the base of the arch. The pressure of the ice against the steel abutments was so great that it caused several steel pieces to bend. Men on both sides of the border were employed to blast the ice away from the abutments. They were successful in 1899 and during the summer months a series of protective walls were built around the abutments to further protect them from the onslaught of winter ice. FOr nearly forty years, the bridge stood That was, until January 23rd 1938, when a sudden wind storm on Lake Erie sent a deluge of ice down river and over the Falls. Within twelve hours the river below the Falls was jammed with ice of such enormous proportions that the ice pressure pushing against the bridge abutments and the hinge supports of the arch caused severe structural damage. It was only a matter of time until the bridge would collapse. The bridge remained intact for several days, drawing thousands of people who came to wait for the end of the bridge to come. The end of the Upper Steel Arch Bridge (Honeymoon Bridge) came at 4:20 p.m. on January 27th 1938, when the span broke free and fell into the gorge onto the ice on the river below. The ice had pushed the bridge away from its abutment on the American side causing the bridge to be pulled of its abutment on the Canadian shore. The only photographs of the bridge collapse were taken by Frank O. Seed of Niagara Falls, New York and Arthur Pink of Niagara Falls, Ontario. The bridge fell onto the river ice in one major piece. 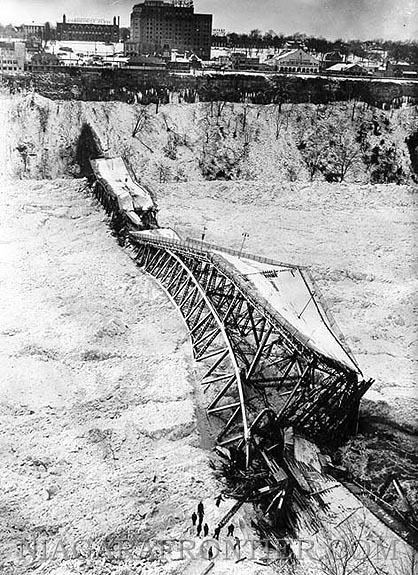 On February 2nd, salvage operations began with attempts to break the bridge into four parts and to remove the debris lying on the slopes of the gorge walls. Most of the bridge sank into the Niagara River, never to be seen again. However, some small portions of the bridge's steel was recovered, and manufactured into souvenirs. This letter-opener knife seen above is one such item. It is 8 inches in length, and about an inch in width. It is engraved "Souvenir Made From the original steel of the Honeymoon Bridge, Niagara Falls - Destroyed by the Great Ice Jam - Jan., 27th, 1938" and bears the profile of the bridge. It was made in Canada, and bears some oxidization from use over the years. Return to the main gallery of the "Check-Six Online Museum"